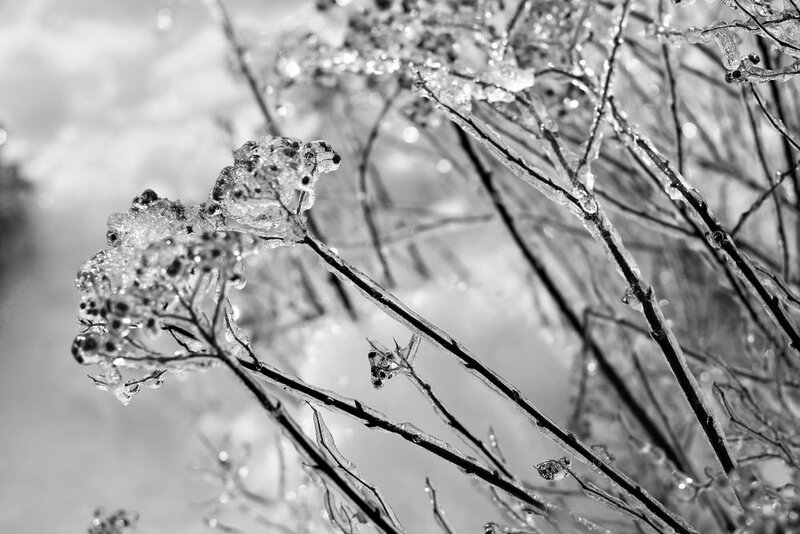 We are promised snow, but receive only a dusting and instead are gifted with ice. All evening it rains down upon us, drumming on the rooftop, accompanied by the whistling of the wind. We awaken the next morning to an icy wonderland and temperatures so cold that there is frost on the inside of our windows. The wind continues to howl, scattering twigs and branches across the lawn and shards of ice upon the roof. I venture outside to take photographs and am entranced by how the ice has completely encapsulated the buds on the plants that border our front walk. I worry that the buds will not open come spring but know that they are resilient and have survived in many ice storms over the years. The world is beautiful when it is encased in ice. Beautiful to look at but dangerous as well; I am grateful that we have not lost any trees and that our electricity has not gone out. Tomorrow the temperatures will rise and the ice will melt, but for now I simply appreciate the beauty outside my window.